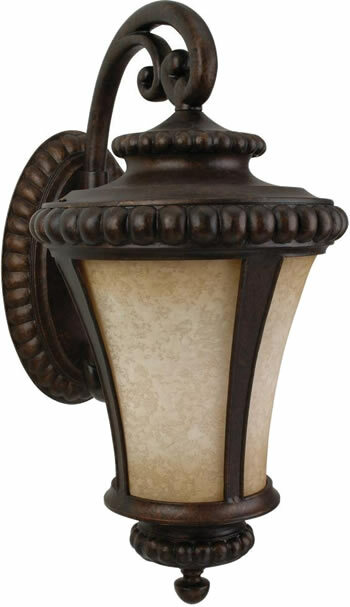 Width	5.5" x Height	14.5"
Width	7" x Height	18"
Width	8.5" x Height	22"
Width	10" x Height	25"
Available in four sizes, with or without glass, incandescent or with integrated LED. 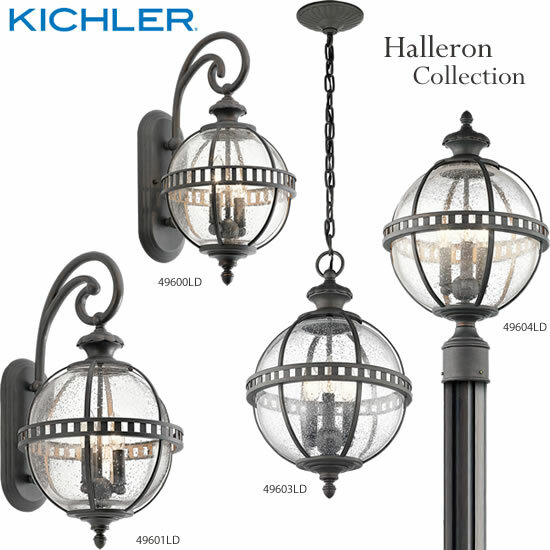 Width	10" x Height	19.25"
Width	12" x Height	22.75"
Width	12" x Height	20.25"
Width	12" x Height	18.75"
Unique shapes and patterns are the highlight of the Halleron Collection. 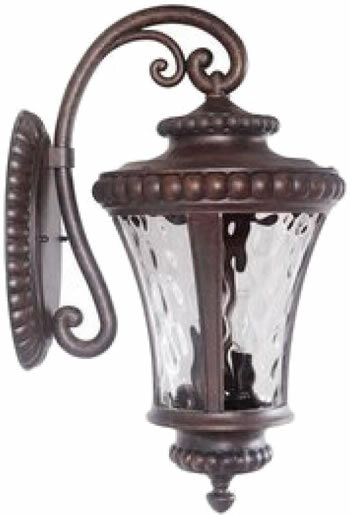 The clean traditional design reflects its Victorian era inspiration. 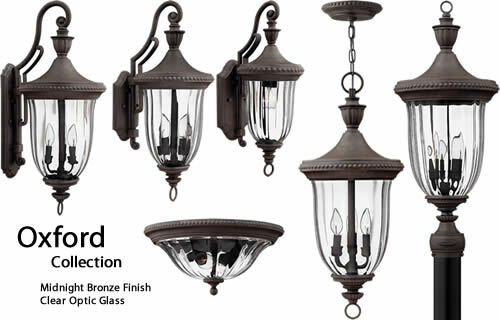 Londonderry finish is a perfect fit for any home. 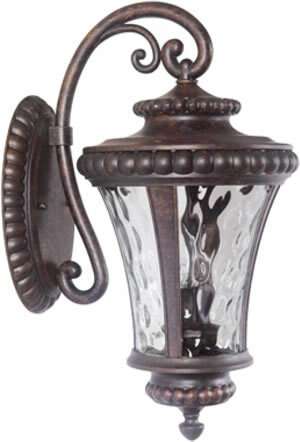 Antique reproduction outdoor lanterns with the look of European antiques. 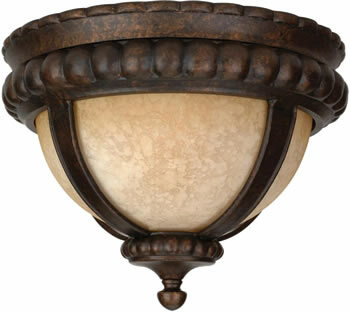 The rich hand-applied finish enhances the hand-blown glass with the look of traditional alabaster. 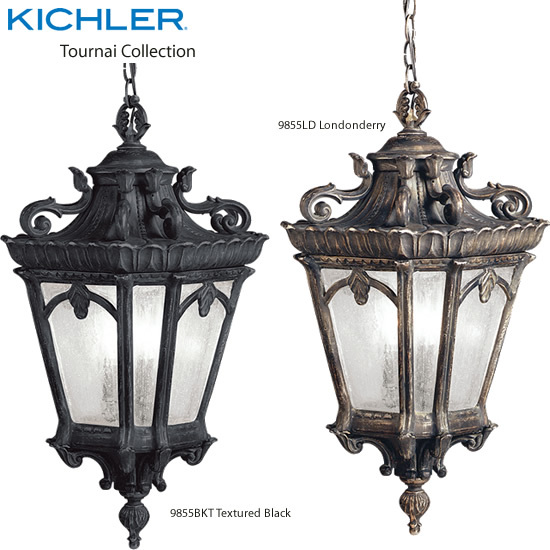 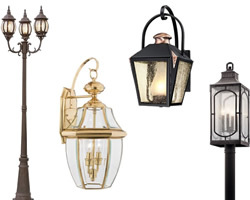 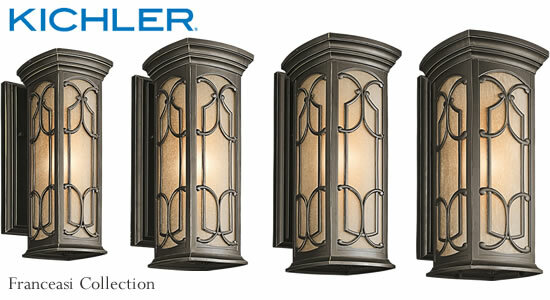 The Kichler Tournai Outdoor Collection has wall, post and hanging lanterns in every size, up to very large 70" tall sizes. 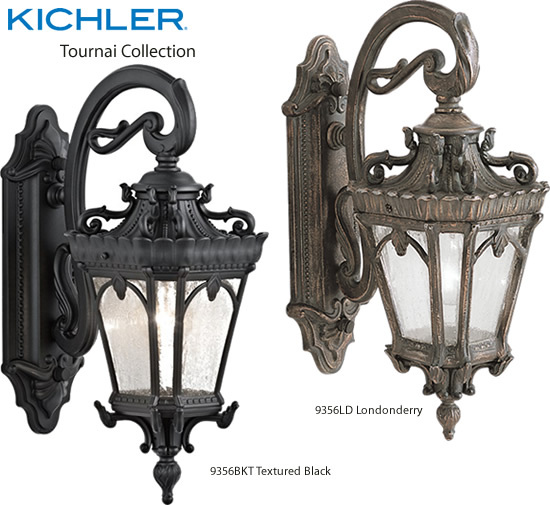 With heavy textures, dark tones, and fine attention to detail, the Kichler Tournai Outdoor Collection really stands out. 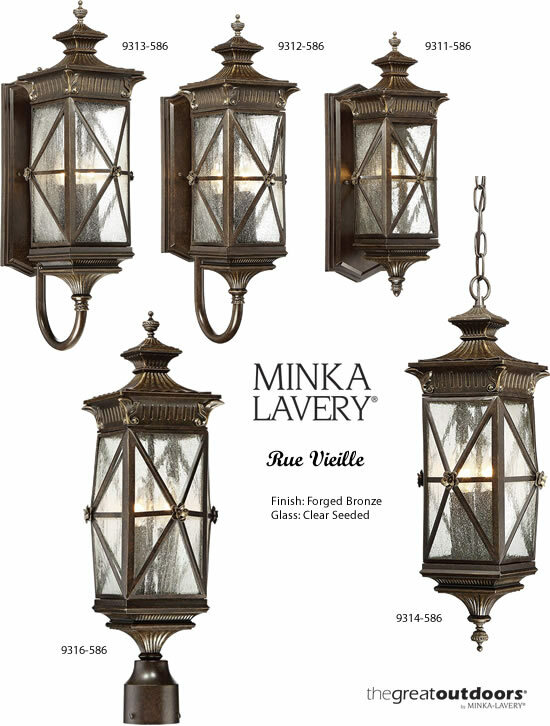 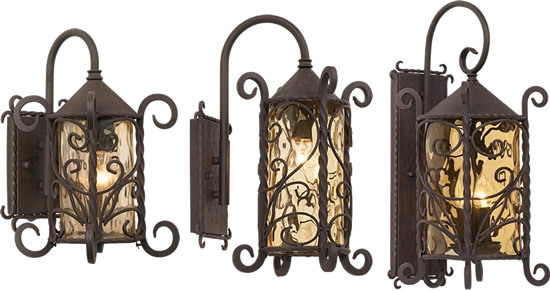 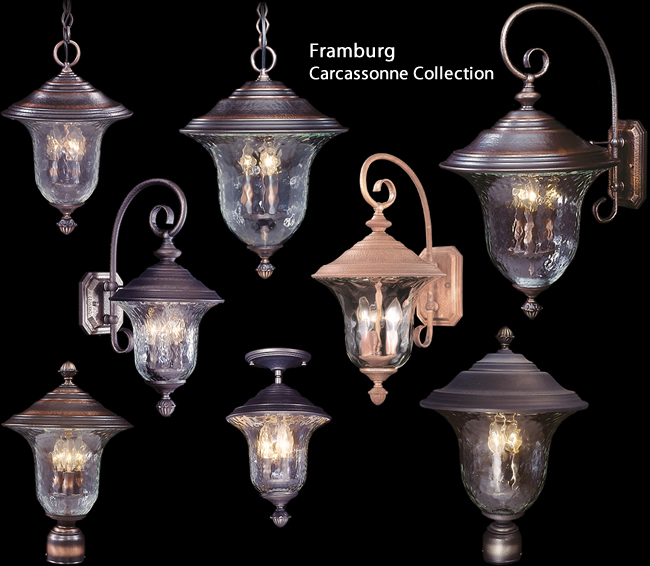 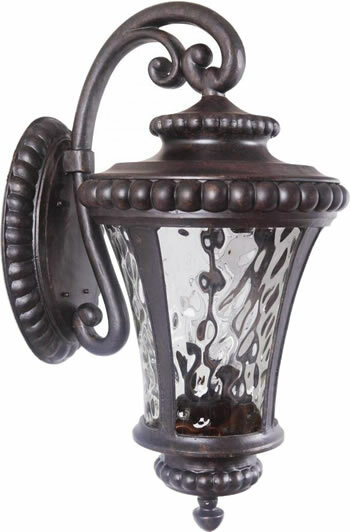 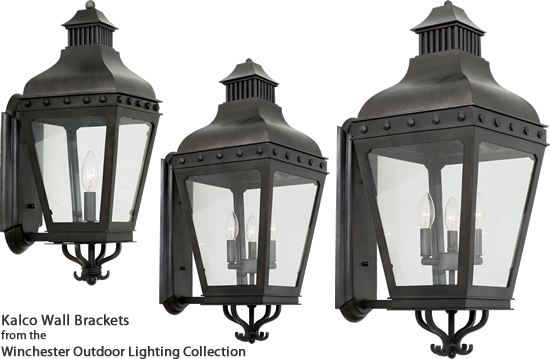 Handmade from cast aluminum in Textured Black or distinctive Londonderry finish with Clear Seedy Glass panels, these pieces have the unique look of antique lighting. 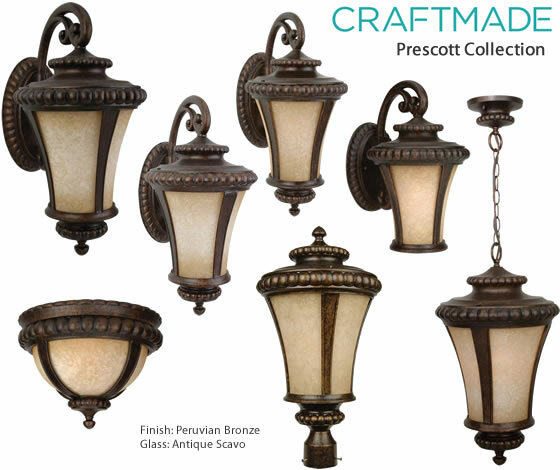 Craftmade's Prescott Outdoor Lighting Collection is bold, yet soft in a traditional sense. 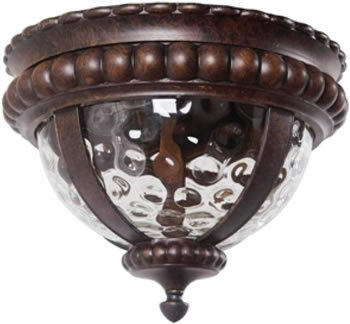 The beaded trim appears hand carved. 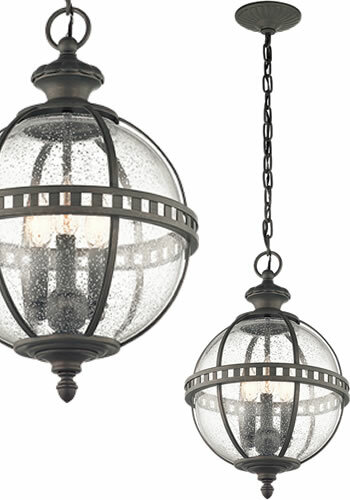 Clear Hammered glass creates a beautiful pattern. 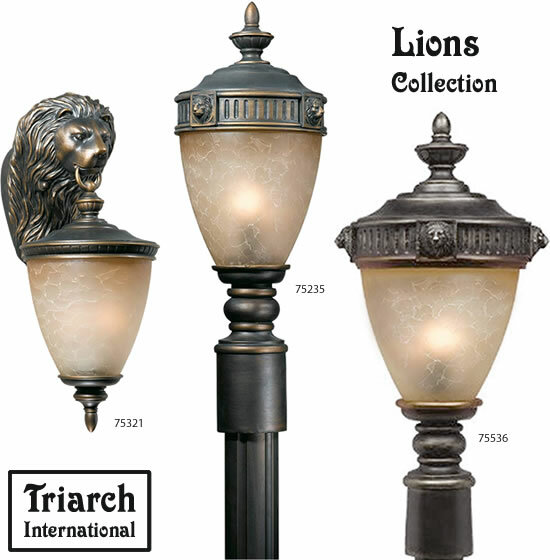 Peruvian Bronze finish is beautiful and long lasting, treated with UV guard. 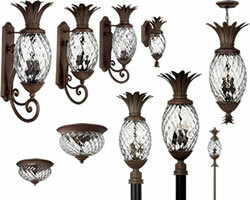 Available in a variety of sizes and multiple options, the Prescott II Collection is an excellent choice for your home. 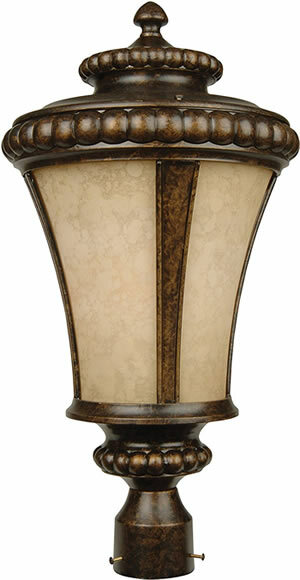 Height 13" x Width 8"
Height 19.75" x Width 10"
Height 23.7" x Width 12"
Height 31.56" x Width 16"
Height 22.6" x Width 12"
Height 21.63" x Width 12"
Height 10.5" x Width 14"
Craftmade's Prescott Outdoor Lighting Collection is bold, yet soft in a traditional sense. 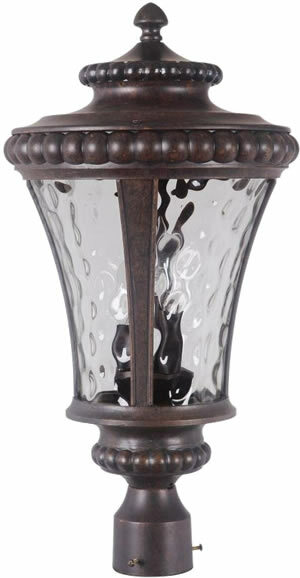 The beaded trim appears hand carved. 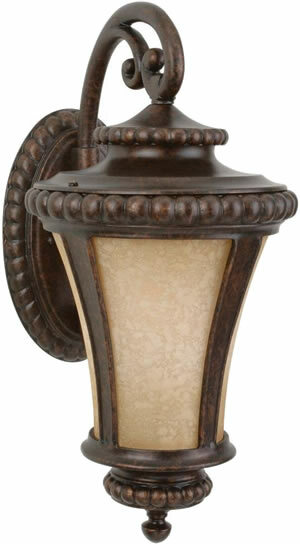 Antique scavo glass casts a warm glow and can hide even the ugliest long-lasting twist fluorescent. 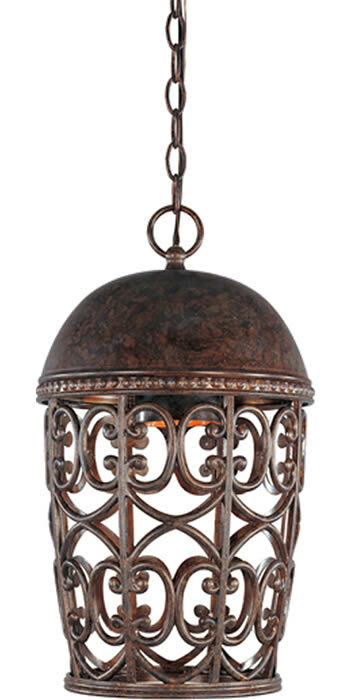 Peruvian Bronze finish is beautiful and long lasting, treated with UV guard. 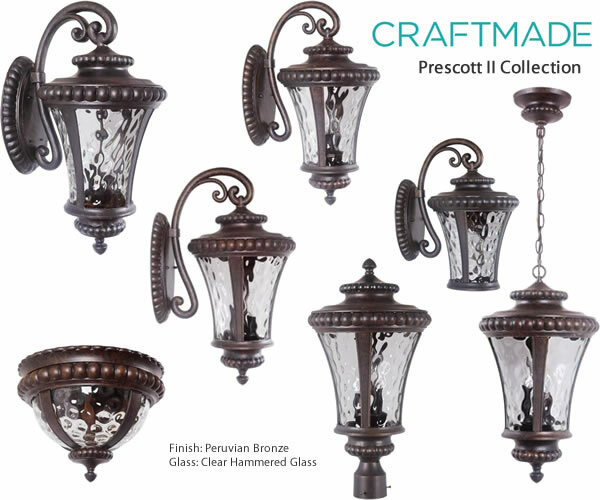 Available in a variety of sizes and multiple options, the Prescott Collection is an excellent choice for your home. 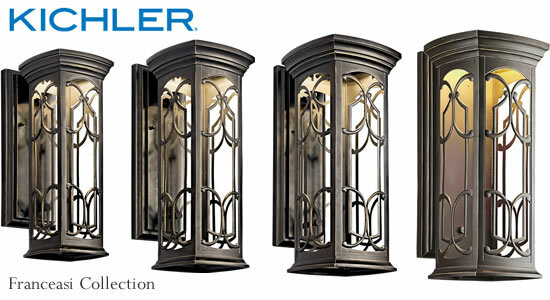 Width 6.5" x Height 13.25"
Backplate Width 4.5" x Height 6"
Height to Center of J-Box 9"
Width 8" x Height 17.75"
Height to Center of J-Box 11"
Width 10" x Height 21.25"
Height to Center of J-Box 12.75"
Width 10" x Height 17.75"
Width 10" x Height 20.25"
Width 6" x Height 11.5"
Back Plate: Height 7.75" x Width 4.5"
Height from Center of Outlet Box 6.25"
With its rustic yet dramatic design, this one-light exterior wall lantern exudes historic charm. 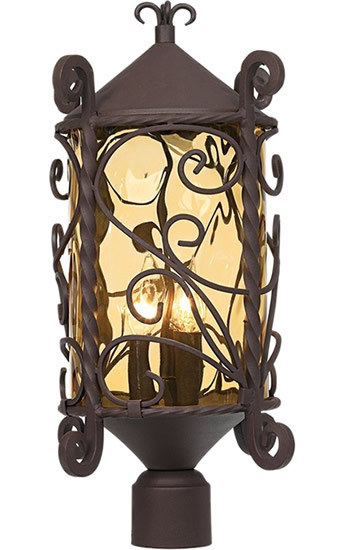 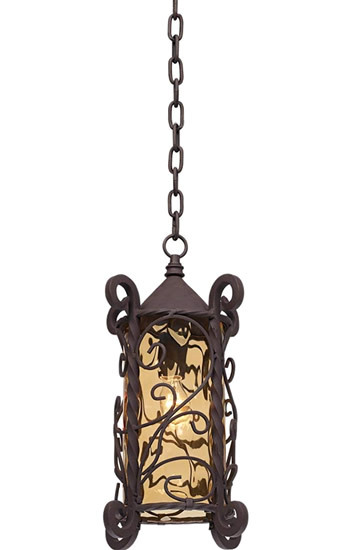 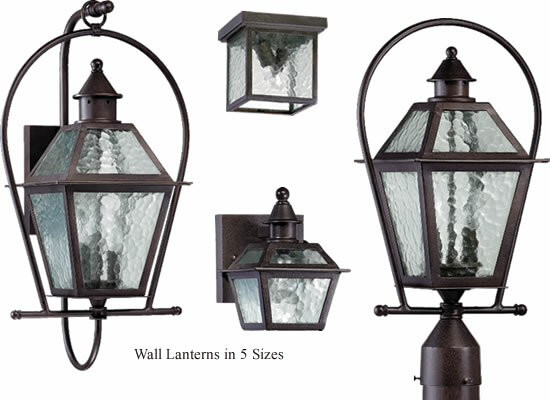 The rust finish, reminiscent of wrought iron, and clear water glass, embellished with a striking lattice design, give the lantern an aged quality that adds to its character. 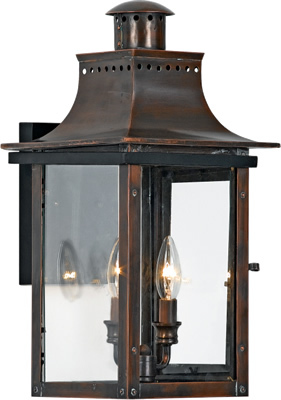 This lantern also features a scroll arm, finial accent, and rope detailing on the cap that matches the border of the back plate. 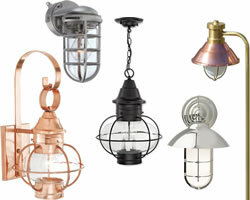 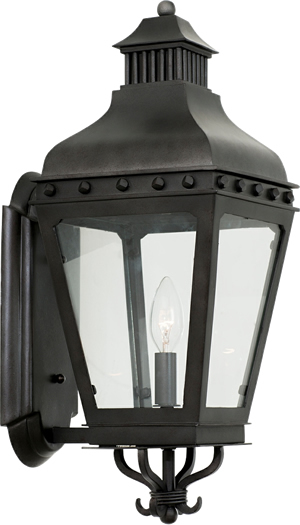 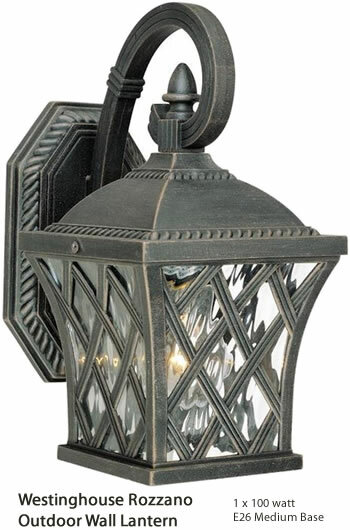 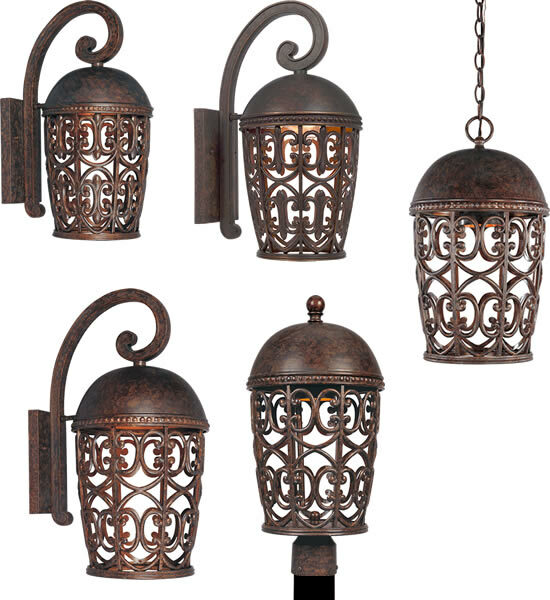 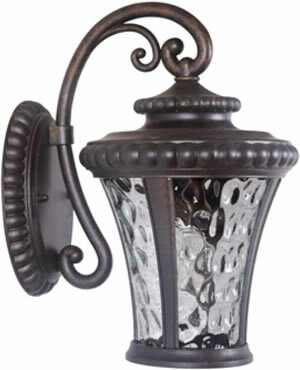 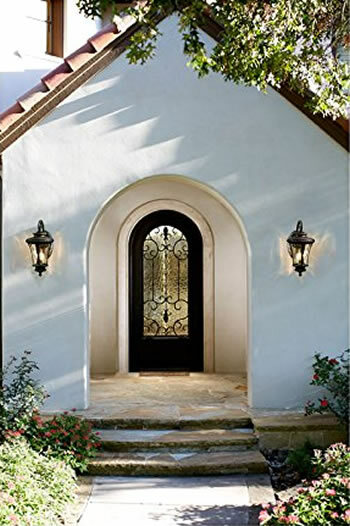 Install this cast aluminum lantern in your front or back entryway or by your garage door. 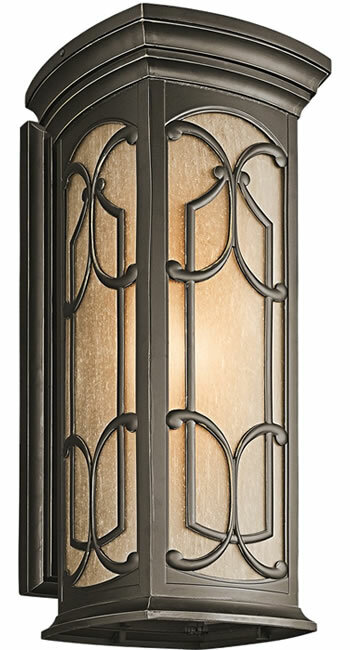 You can also use it to create a welcoming accent for your porch, deck, patio, balcony, or side entrance. 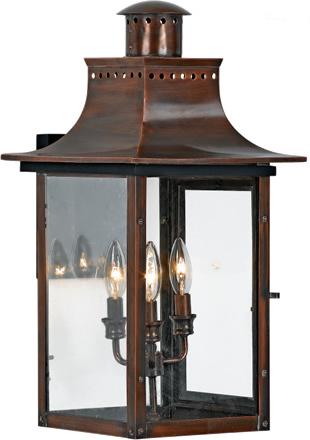 No matter where you place it, you will enjoy the lantern's inviting light and antique look. 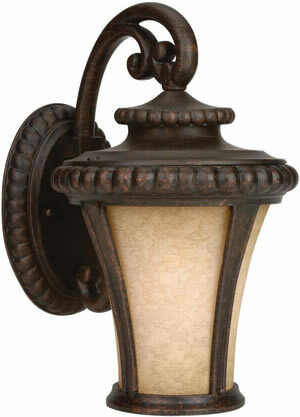 Dimensions: 20 1/2" Height x 10" W, 11 1/2" Ext. 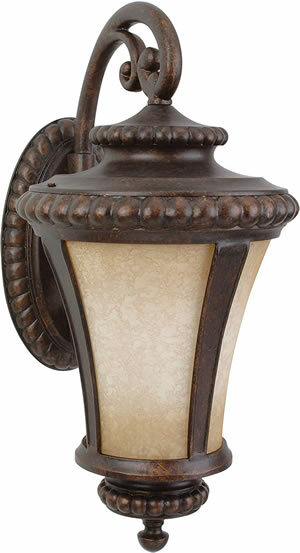 Shade: 5 1/2" x 10"
Dimensions: 23" Height x 12" W, 13 1/2" Ext.